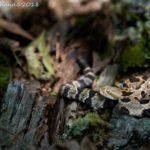 When most of you think of snakebites, you think of pit viper envenomation (or possibly the alcoholic beverage, which contains equal parts cider and lager – I’d totally like that! ), and I get that. 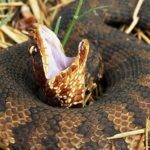 Nationally, 98% of snake envenomations are from the various pit vipers (rattlesnakes, water moccasins/cottonmouths, and copperheads). That said, coralsnakes are cool and fascinating – and you need to know about them. 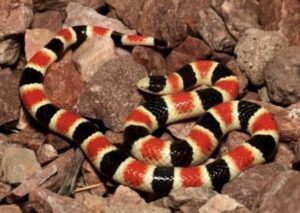 Fig 1: Micruroides euryxanthus, the Arizona (or Sonoran) Coralsnake, is found in Arizona and western New Mexico. Worldwide, there are approximately 100 coralsnake species. In the Eastern hemisphere, there are approximately 20 species divided into three genera. However, taxonomy is always changing and there may be more or fewer by the time I finish typing this! 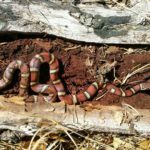 Most of the coralsnake species are found in the western hemisphere, where you will find approximately 80 species, also divided among three genera. The genus Micrurus has the most species, including two of the three that are native to the United States. 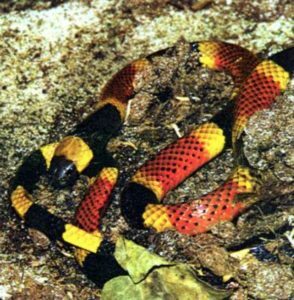 Fig 2: Micrurus tener, the Texas Coralsnake, is found in Texas, southern Arkansas, and western Louisiana. 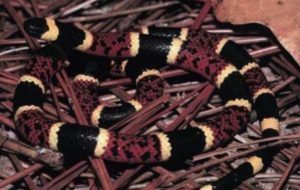 Fig 3: Micrurus fulvius, the Eastern (or Harlequin) Coralsnake, can be found in Florida, Alabama, Mississippi, far eastern Louisiana, Georgia, and North and South Carolina. 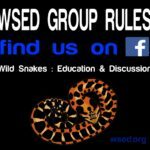 People have come up with all sorts of rules and mnemonics to identify coralsnakes and distinguish them from other species. “Red on yellow, kill a fellow. Red on black, venom lack” is the most common, and it works… except for when it doesn’t. Figures 1 – 3 feature our native coralsnakes. 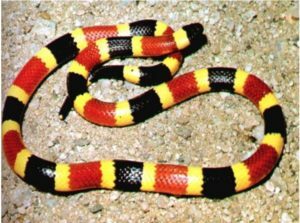 Figure 4 shows a Scarlet Kingsnake (Lampropeltis elapsoides) with which coralsnakes are commonly confused. But but but but but, not all coralsnakes adhere to the rhyme – Figure 5 is a graphic that has circulated on the internet for years. Every snake featured is a Texas Coralsnake. 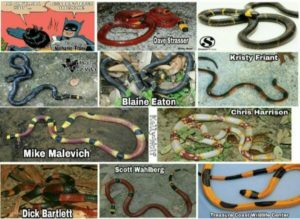 Conversely, there are snakes that have the same pattern as coralsnakes. 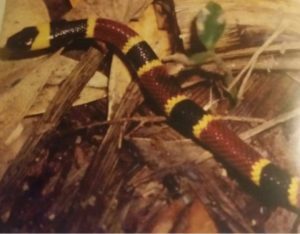 Figure 6 features a Variegated False Coralsnake (Pliocercus elapoides). 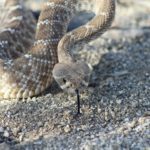 Figure 7 is a picture of a Sonoran Shovel-Nosed Snake (Chionactis palarostris). Finally, the “rule” only applies to coralsnakes north of Mexico City. Figure 8 is a South American coralsnake, Micrurus lemniscatus. Red on black, Jack! 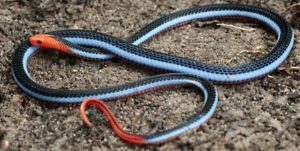 And Figure 9 is a photograph of a blue Malaysian coralsnake, Calliophis bivirgata, which is not so red and yellow, etc. Coralsnake venom has a variety of components. 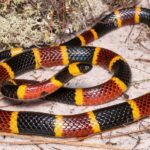 Unlike pit viper venom, coralsnake venom doesn’t really have cytotoxins or clinically-significant hemotoxins. It is mostly neurotoxins, including multiple isoforms of phospholipase A2. Some have pre-synaptic β-toxins, which prevent the release of acetylcholine (ACh) at the neuromuscular junction. Others have α-toxins, which compete with ACh for post-synaptic binding sites. 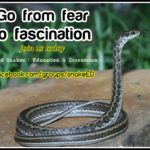 In the US, the danger generally increases from West to East if there is an envenomation. The incidence of dry bites is somewhere between 20 – 50%. 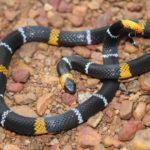 Although coralsnakes do not have the efficient venom delivery that pit vipers have, the belief that they must “chew” on the victim for a long period to envenomate is a myth. If there is an envenomation, the local findings are unexciting. There is no significant swelling or bruising. Sometimes there is erythema, and sometimes it is not present. On occasion there is no visible fang mark. 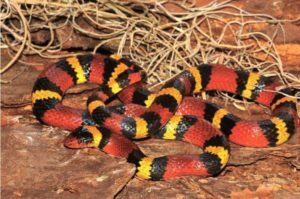 Bites from the Texas Coralsnake often cause pain (which may be severe) but generally little else. I cannot overemphasize how painful some of these bites are. Some patients require SEVERAL HUNDRED MICROGRAMS of fentanyl in the first hour or so to get the pain under control, and many patients wind up on PCAs for a half-day or more. Objective toxicity, which can range from ptosis all the way to skeletal and respiratory muscle paralysis, is rare with M. tener bites. It is not typical (e.g. occurring in > 50% of cases) for M. fulvius bites, but it is not rare. In May 2018, an Alabama man made national headlines after getting paralyzed from a bite. When assessing patients with possible coralsnake envenomation, it is important to monitor for neurological toxicity for at least 12 hours, although I prefer observing for at least 18 hours. If you have the means, dynamometry is a great way to assess skeletal muscle strength. If you don’t have a fancy device, you can conduct serial hand-grip strength measurements. I also like to have respiratory therapy check for a negative inspiratory force (NIF). It’s an easy, objective method of assessing respiratory muscle strength. I also recommend end-tidal CO2 monitoring. Management consists of good supportive care and, when indicated, antivenom. Of course, if venom absorption can be prevented, toxicity can be averted. Pressure immobilization, which is *not* recommended in pit viper envenomation, may be helpful in limiting absorption of the neurotoxins released in coralsnake envenomations. As for antivenom there are a lot of misconceptions, so let me address them here. People have different thresholds for pulling the trigger, but I typically wait until there is any evidence of objective neurotoxicity. You hear a lot of people (including media folk) talk about an antivenom shortage. This is fear mongering! If you define a shortage as a situation where demand exceeds supply, there is no shortage. 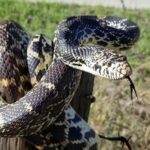 Although Pfizer had discontinued production of North American Coralsnake Antivenom (NACSAV), one of the lots in existence keeps getting its expiration date extended. Lot L67530 now has an expiration date of January 31, 2019. It is my understanding that they will or have resumed production, and even if we had no NACSAV, there are alternative antivenoms available. 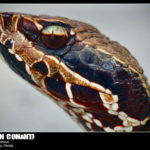 Coralmyn, produced by Bioclon using antibodies to the Central American Coralsnake (M. nigrocinctus), is effective in eastern coralsnake envenomation. SAC-ICP, produced by Instituto Clodomiro Picado using M. nigrocinctus, is also effective. Antivenom designed to treat the Australian Tiger snake (Notechis scutatus) has also proven to be effective against M. fulvius. 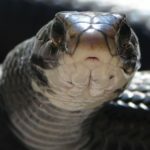 Antivenom can prevent neurological toxicity, but if it is not given in a timely fashion some patients may develop paralysis and may require mechanical ventilation – but there may be another option: neostigmine, a cholinesterase inhibitor, may prevent paralysis by raising the concentration of ACh to compete with the α-toxins post-synaptically. Spencer Greene, MD, MS, FACEP, FACMT is the Director of Medical Toxicology and an Assistant Professor in the Henry J.N. Taub Department of Emergency Medicine at Baylor College of Medicine. He directs the only medical toxicology service in Houston. Clinical interests include salicylates, anticonvulsant toxicity, physostigmine, alcohol withdrawal, and envenomations, and he consults on more than 100 bites and stings annually, including snakebites, spider bites, asp envenomations, and jellyfish stings. 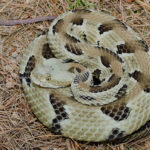 He serves as a consulting toxicologist for the Southeast Texas Poison Center and has directed the annual Houston Venom Conference since its creation in 2013. He was also the course director for the American College of Medical Toxicology's Natural Toxins Academy.